Photo courtesy of Shane Lardinois. 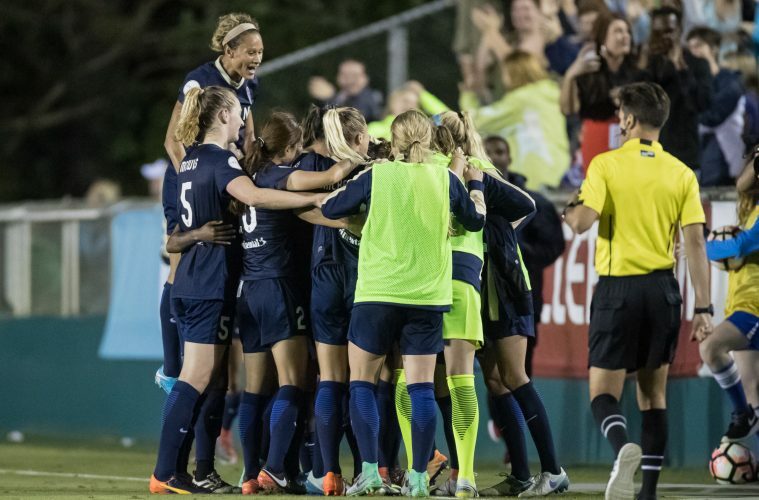 The North Carolina Courage remained undefeated after a 3-1 win over the Orlando Pride at Sahlen’s Stadium at WakeMed Soccer Park on Saturday. The Courage improve to 3-0-0 on the National Women’s Soccer League (NWSL) season and sit atop the league table. Jessica McDonald started the scoring for the Courage in the 6th minute when she got on the end of a Ashlyn Harris save that rebounded Sam Mewis started the play by switching the point of attack out to the right to find Makenzy Doniak, who crossed the ball in. Lynn Williams got to it and headed the ball back toward the center of the goal forcing Harris to make a left-handed save. McDonald slotted the ensuing rebound past Harris near post. Harris would be called on again in the 12th minute when Yuri Kawamura headed a corner kick back toward the middle of the box and found an unmarked Williams, who one-timed a left-footed shot that forced Harris to her right to make the goal line save. Harris denied Debinha in the 21st minute when she knocked the Brazilian’s right-footed strike from the top of the box over the crossbar. The Pride almost equalized in the 23rd minute when Marta, in her first NWSL start, found space and time on the left and crossed the ball in but Jasmyne Spencer was unable to get a foot on it at the back post. Camila equalized in the 27th minute off an unassisted strike. Running at the back line and slight away from goal, Camila unleashed a right-footed shot from the top of the box that beat Courage goalkeeper Sabrina D’Angelo to the far post. The 1-1 stalemate didn’t last long. Sam Mewis converted from the penalty spot after Laura Alleway was called for a handball to put the Courage back on top, 2-1, in the 32nd minute. Doniak took the ball to the end line and cut back into the box and fired a shot that hit Alleway on the left arm. The action didn’t stop there. In the 39th minute, Spencer crossed the ball in from the right, and Marta got a foot on it to volley it but D’Angelo was there for the save. Abby Dahlkemper cleared the rebound off the line. The Courage almost added another in the 48th minute when Williams pounced on a soft back pass from Alleway and was in on goal but Harris was there to make the kick save. In the 63rd minute, Marta played a ball over the top that found Chioma Ubogagu in the seam between Abby Erceg and Kawamura. Ubogagu’s shot was pushed wide by D’Angelo to keep the score at 2-1. The final goal of the match came in the 70th minute. Debinha pounced on a poor clearance from Harris and crossed the ball to Williams in the box, who brought it down with her left foot, then took the volley with her right foot and fired a shot that hit the far post and went in to put the Courage up, 3-1. North Carolina heads to Boston to face the Breakers, while Orlando will travel away to meet FC Kansas City.